The coconut oil is easily digested and absorbed; up to 95-98% as fast as butter fat, thanks to the low molecular weight of fatty acids. As other vegetable oils, it hardly contains cholesterol. In countries where coconuts are cultivated, they are commonly used for cooking, making the proteins and carbohydrates of low quality more digestive. In fact, the naturally saturated mid-chain coconut oil is healthier than other artificially hydrogenated short-chain vegetable oils. The coconut milk is a good source of fibre, helping to keep the levels of potassium. Potassium is one of the most important compounds for the human metabolism due to the function that carries out in the intracellular balance. Potassium is a basic element in our diet; its lack results in muscular weakness, mental disorder and heart problems. The pulp and milk help to prevent the effects derived from the lack of potassium, among which is the neuromuscular failure (weakness or paralysis), problems in the respiratory system or cardiovascular diseases. 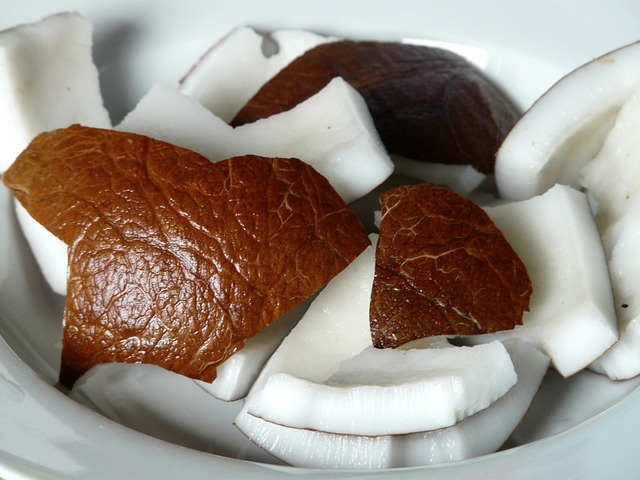 The consumption of coconut has a significant importance for the potassium supplied to our organism. This element is basic in our diet. Its lack leads to muscular weakness, mental disorder and heart problems. The pulp and milk help to prevent the effects derived from the lack of potassium, among which is the neuromuscular failure (weakness or paralysis), problems in the respiratory system or cardiovascular diseases.